The argument among scientists as to whether there are some inheritable gene mutations for multiple sclerosis (MS) may have just come to an end due to new data from a recent study published by researchers at the University of British Columbia (UBC) and Vancouver Coastal Health. The investigators were able to provide compelling evidence that MS can be caused by a single genetic mutation—a rare alteration in DNA that makes it very likely a person will develop the more devastating form of the neurological disease. In the current study, the investigators reviewed materials from the Canadian Collaborative Project on Genetic Susceptibility to MS, an extensive database that contains genetic material from almost 2000 families across Canada. Using exome sequencing, the researchers discovered a mutation in two Canadian families that had several members diagnosed with a rapidly progressive type of MS, a condition in which a person's symptoms steadily worsen and for which there is no effective treatment. In the two families described in this study, two-thirds of the people with the mutation developed the disease. “The mutation we found, in a gene called NR1H3, is a missense mutation that causes loss of function of its gene product, LXRA protein,” remarked co-senior author Weihong Song, M.D., Ph.D., professor and research chair in Alzheimer's Disease at UBC. “This mutation puts these people at the edge of a cliff, but something still has to give them the push to set the disease process in motion,” Dr. Vilariño-Güell added. MS is a neurodegenerative disease in which the immune system attacks the myelin that protects nerve fibers, upsetting the flow of information between the brain and the body—afflicting about 2 million people worldwide. Interestingly, previous work with NR1H3 gene knockout mice led to neurological problems in the rodents, including a decrease in myelin production. “There is clear evidence to support that this mutation has consequences in terms of biological function and the defective LXRA protein leads to familial MS development,” Dr. Song noted. The UBC researchers say that the discovery of this mutation will enable them to develop cellular and animal models for MS that are physiologically relevant to human disease—tools that have not previously been available. “These models will provide a good way for us to study the mechanism underlying the disease, as well as to screen for drugs that target it,” Dr. Song stated. These new findings could help in the search for therapies that act upon the gene itself or counteract the mutation's disease-causing effects. The researchers noted that there is already interest in targeting this pathway for drug development in other diseases, including atherosclerosis. 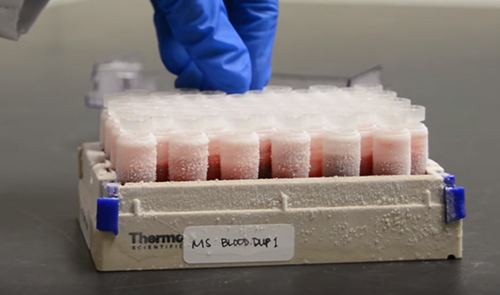 “These are still early days, and there is a lot to test, but if we are able to repurpose some of these experimental drugs, it could shorten the time it takes to develop targeted MS treatments,” Dr. Vilariño-Güell said.